The processing time for asylum applications in Germany has dropped to six months on average, the German government said. Opposition party The Left criticized the duration of the procedures, which the government had intended to take no longer than three months. 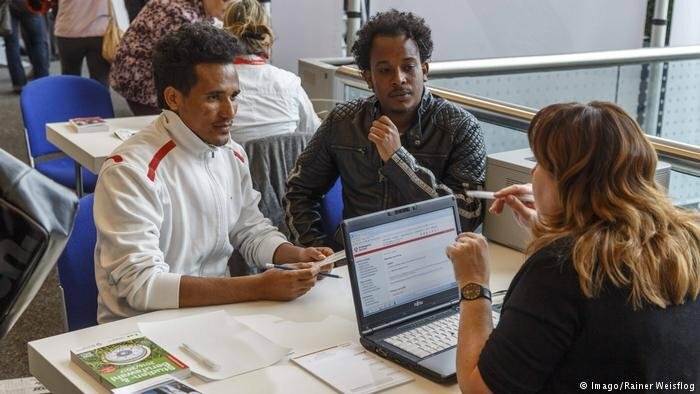 In the third quarter of 2018, Germany’s Federal Office for Migration and Refugees (BAMF) needed an average of 6.1 months to process an asylum procedure, thus clearly falling short of its own stated goal of a maximum processing time of three months. That’s according to a reply by BAMF to an inquiry by Germany’s left parliamentary group, as German media group Funke Mediengruppe reported on Monday. In the first and second quarters of last year, it took BAMF 9.2 months and 7.3 months respectively to make a decision. In 2017, asylum seekers had to wait 10.7 months on average. Certain nationalities in particular faced above-average waiting times: In the third quarter of 2018, people from Pakistan waited for 9.1. months, the Russian Federation for 8.8 months, Somalia for 8.4 months and Afghanistan for 7.5 months on average. Among asylum seekers from Syria, on the other hand, the average processing time was comparatively fast with 4.4 months. Unaccompanied minors had to wait particularly long: In the third quarter of 2018, the process took 7.7 months on average, down from 10.2 months in the first nine months. With 12.6 months, young refugees from Afghanistan had the longest waiting time of all. Back in September 2015, at the beginning of the so-called refugee crisis, German Chancellor Angela Merkel had reached an agreement with state prime ministers to complete asylum procedures within three months. German politician Ulla Jelpke of opposition party The Left pointed out that overlong asylum procedures were connected to an "unacceptable uncertainty" among people seeking protection. She demanded an "uncomplicated right to stay for all those asylum seekers whose applications have been pending for more than 12 months," adding that such a ‘backlog regulation’ would also relieve BAMF. Earlier this month, the Bavarian Refugee Council had criticized the so-called anchor centers for asylum seekers, which are supposed to speed up the asylum process thanks to different authorities being in one place. Among other things, the council said rejections would only seldomly become final as many refugees appeal the decision in court. Some asylum seekers wait for two years on a trial. One reason for the drop in processing time in the third quarter of 2018 could be the lower number of newcomers: Last year, 37.000 fewer applications were filed than in 2017 (a drop of 16.5 percent). The total number of applications in 2018 was close to 186,000.